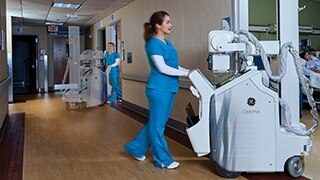 Built upon the proven legacy of the AMX mobile X-ray system, the OptimaTM XR220amx brings the benefits of digital imaging technology to patients and simplified workflow to technologists. Based on our revolutionary AMX family of mobile x-ray systems, OptimaTM XR220amx takes digital x-ray to the point of care. 24/7 Availability - The system remains on standby and is ready to work even while charging. No boot-up is required. Uninterrupted Work - Thanks to "Smart Charge" automatic-charging algorithms, you can recharge the system and continue taking exposures. Stow while Charging - Our wireless digital detector, FlashPad, automatically charges while stowed in its bin, so technologists can maintain focus on patient care. Abundant Storage - You'll have ample space to store tape, pens, wipes, markers and more thanks to roomy storage trays. Durable Detector - FlashPad utilizes a carbon-fiber housing that protects an internal floating sub-assembly to help make it durable. 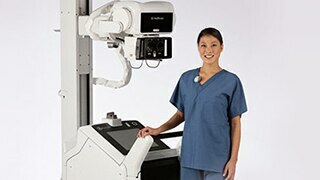 Optima XR220amx digital mobile x-ray system. FlashPadTM is GE's next-generation wireless digital detector. It is designed for digital use and built for reliability. FlashPad is the first wireless detector to operate with Ultra-Wideband connectivity. It communicates independently on a dedicated channel - so data is transferred with speed and reliability. At GE, we understand that you need to do more with the equipment you have. FlashPad enables advanced application on premium GE radiography systems. Even if you're not using advanced applications today, FlashPad allows you that capability in the future by offering an investment protection. X-ray to the point of care. 24/7 Availability - The system remains on standby and is ready to work even while charging. The OptimaTM XR200amx is a digital-ready system that can meet your x-ray needs and budget today, with the ability to upgrade to digital when you're ready. Designed to be the highest resolution pediatric capable mobile x-ray systems in the industry.